By Arthur Etchells·	 11/14/2014, 2:51 p.m. 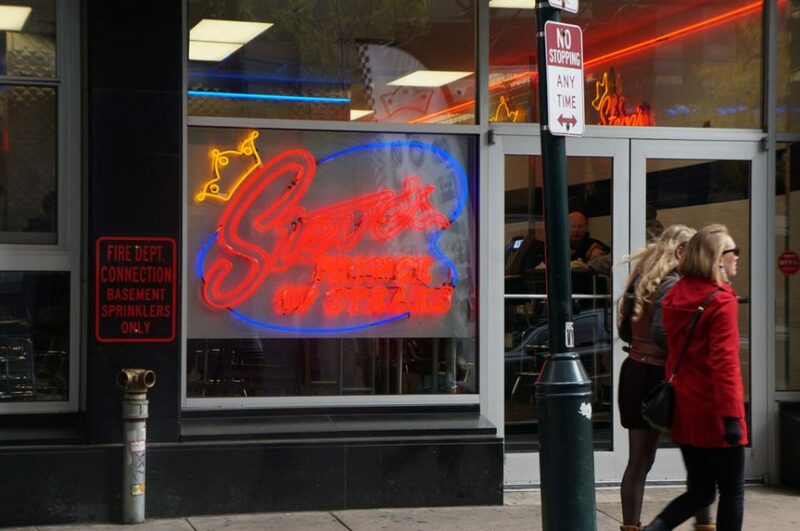 Whenever Pat’s and Geno’s Steaks are mentioned, undoubtedly someone will weigh in with the seemingly erudite argument that they don’t pick a winner between those geographic rivals, but rather they prefer Steve’s Steaks. 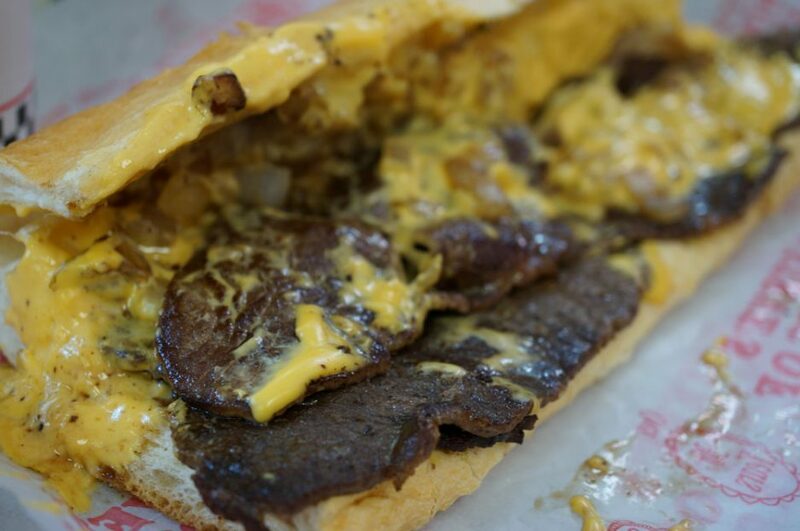 The Philadelphia cheesesteak joint has been Northeast Philadelphia royalty since opening in the early 1980s. 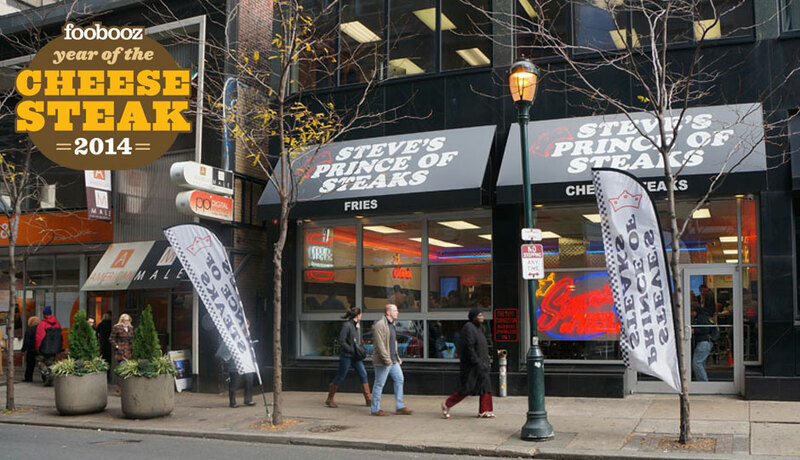 In March of 2013, Steve’s opened a branch of cheesesteak kingdom at 16th and Chestnut Streets in Center City Philadelphia. 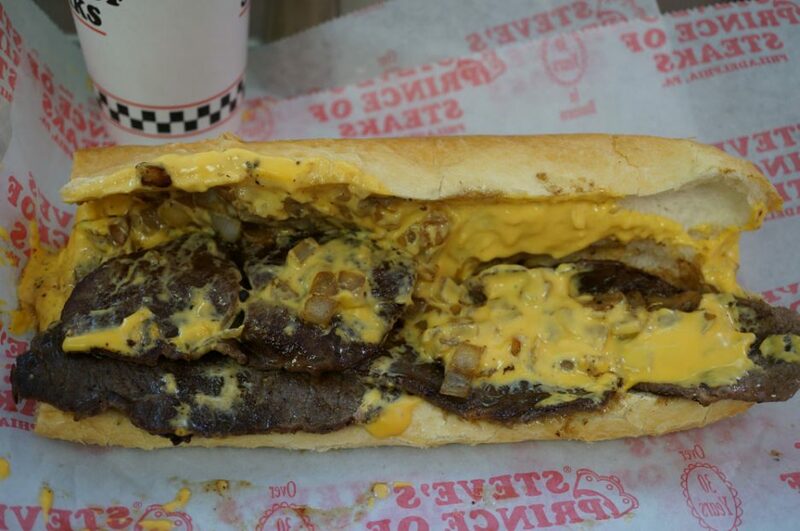 Today, we measured how Steve’s Prince of Steaks stacked up against the best cheesesteaks in Philadelphia. Roll: Italian roll sliced into a foot long piece. Meat: Rib-eye, sliced and unchopped. 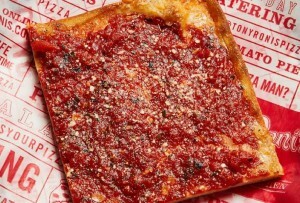 Cheese: American and Whiz are the standard options. 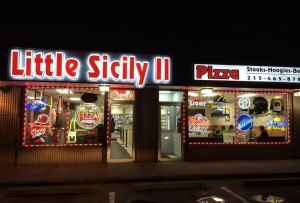 Provolone and mozzarella 30¢ extra. 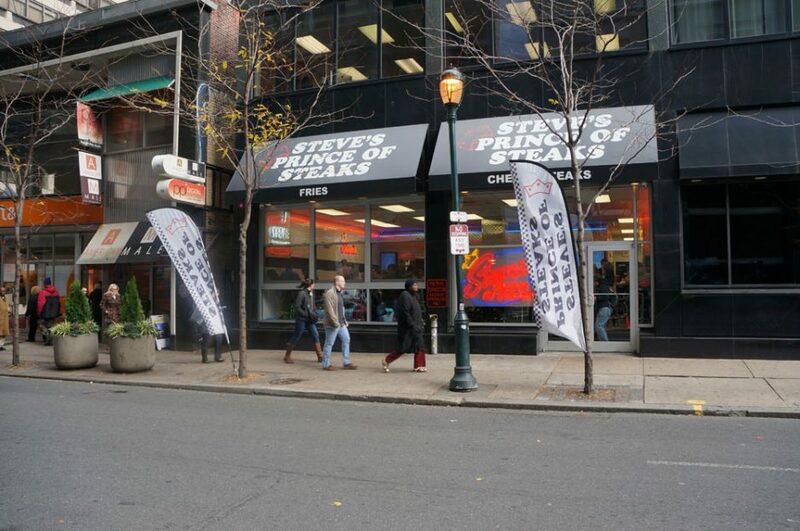 Pro Tip: Steve’s Prince of Steaks Center City location offers delivery and curbside pickup. On a Friday at lunchtime, Steve’s Prince of Steaks was pretty much at capacity and had a line five-or-six deep. Much like the cheesesteak spots in South Philadelphia, you order your steak at one window and your drinks and fries at another. Then, you hang out and wait for your name to be called and return to the first window for your sandwich. 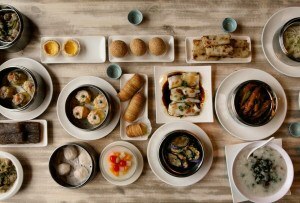 Though I’ve never really argued with the system previously, it seems a bit awkward here. 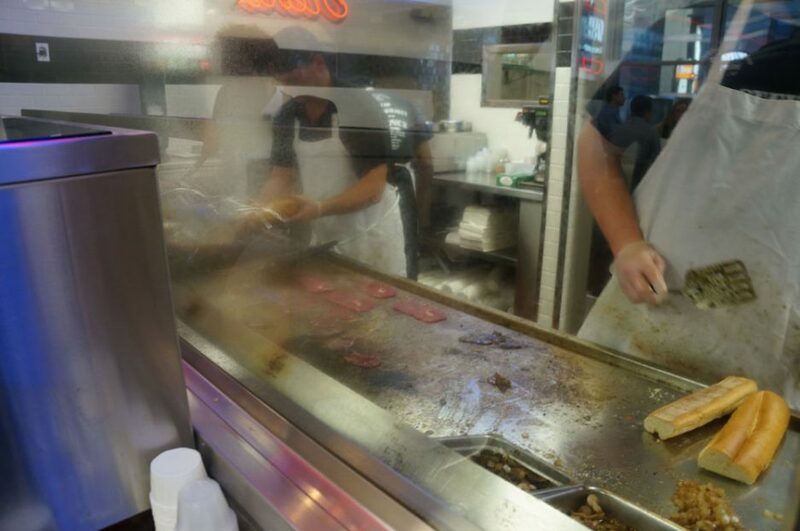 Wouldn’t it be easier to just hand out the steaks from the soda/fry window, since that’s where you end up anyway? But I digress, upon receiving my cheesesteak, I found an unoccupied stool along the window. Unfortunately the corner I chose, along with much of the floor, was littered with napkins, ketchup and peppers. It would be easy to blame Steve’s Steaks employees for allowing the litter to pile up but come on people, clean up after yourselves. 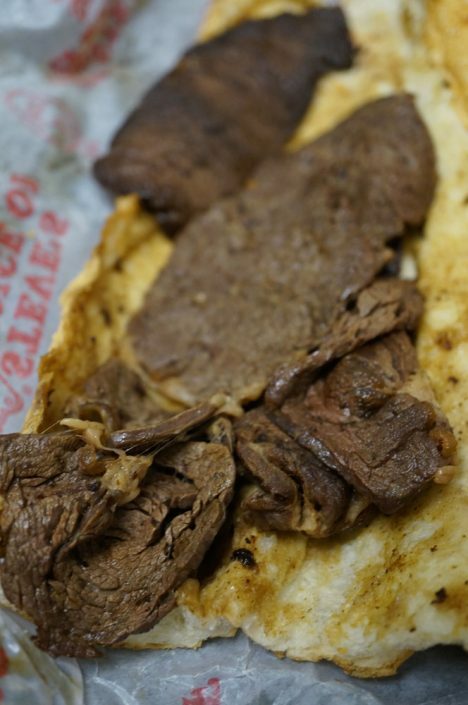 After several photos I was prepared to jump into my whiz wit steak. 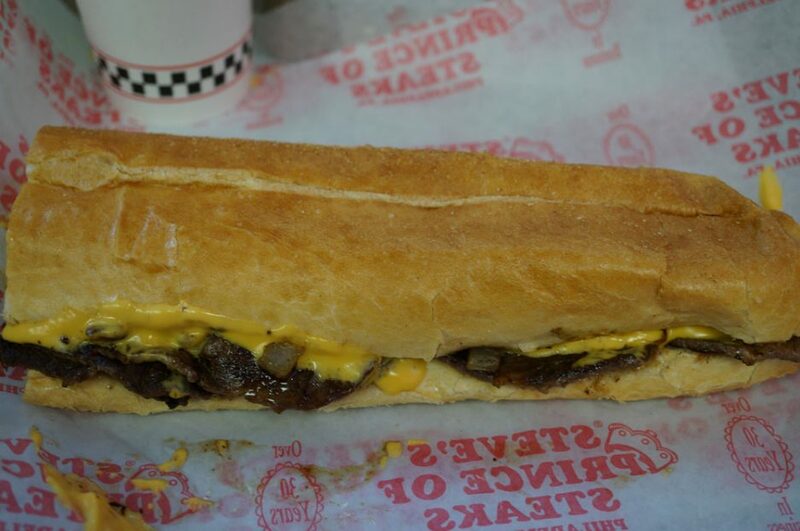 As has been my experience at Steve’s the cheesesteak compresses into a nearly flat sandwich, unlike many fuller steaks I’ve gotten around town. In fact, I purchased a control plain steak in order to weigh the meat back at the office. 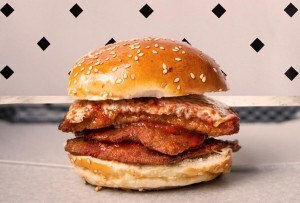 It came in at 4.1 ounces, far from a belly buster. The meat is only seasoned with oil so you’ll be on your own to add any additional seasoning. 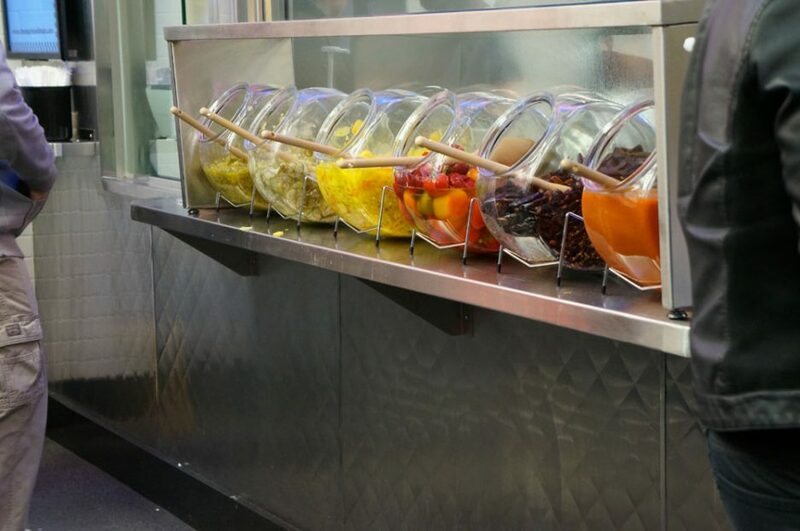 Luckily the free pepper bar can spice up your steak (though the watery hot sauce doesn’t compare to the extremely spicy sauce served at Philip’s Steaks or Pat’s). The meat at Steve’s is served unchopped, unfortunately that leaves the gristle front and center. The biggest problem with the steak though was the uneven thickness of the meat. That led to two issues, some pieces were seriously overcooked and others offered a bit more chew than I want from a cheesesteak. When I sat down and looked out the window, I imagined the passersby being jealous of my steak. 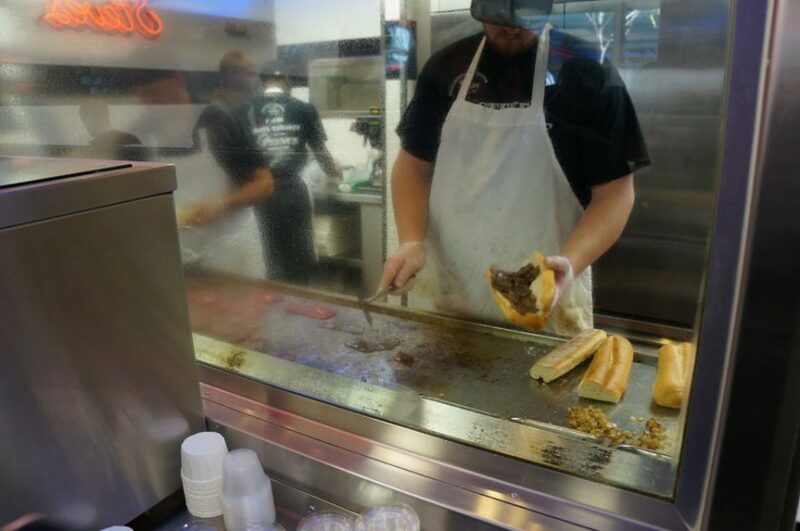 By the end, I imagined they were looking at me with disgust, much as I felt about my Steve’s Steaks cheesesteak. 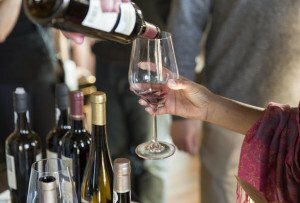 Steve's offers delivery and curbside pickup. Grab some peppers to add some kick to your steak sandwich. Unchopped steak on the flat top. 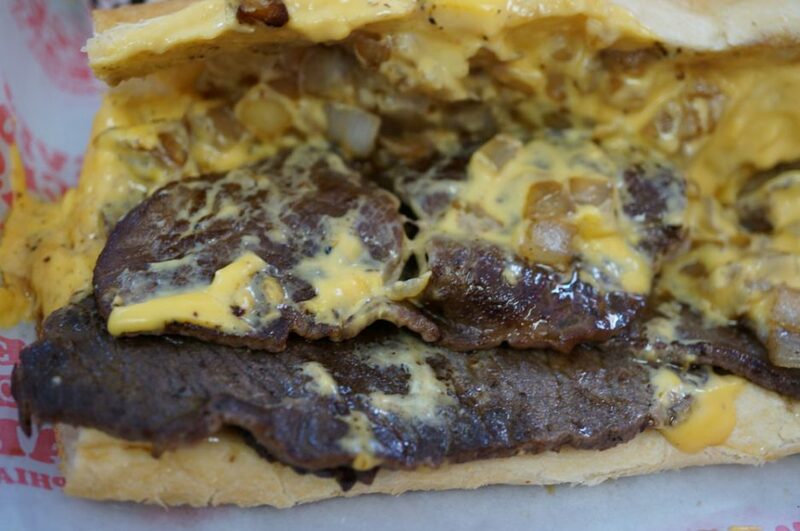 Cheesesteak with whiz and onions. 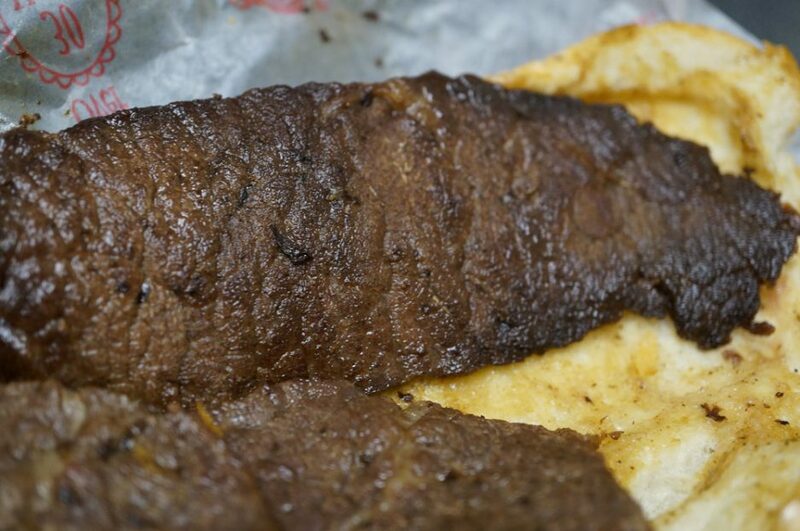 Closeup of the control steak's meat. Sometimes you shouldn't look to closely at your steak. Another shot of the meat. 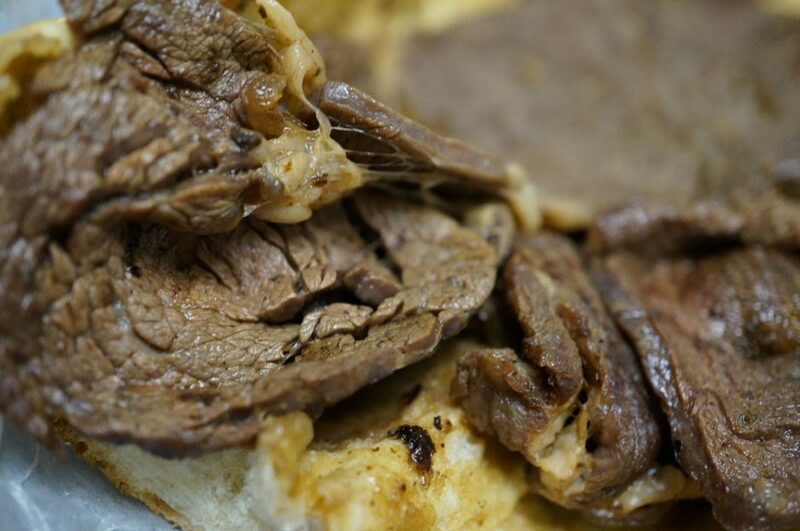 For more of the best cheesesteaks in Philadelphia, read our Year of the Cheesesteak section.